Great win for the Mo last week, so got to be confident going into this one. With our recent additions we seem to have more of a threat going forward, evidenced by the 5 goals last week. We seem to be shipping a few as well so Stenny will feel they can get after our defence. 8-7 to the Mo. Interesting fixture this. Was surprised that Stenny rather than the Blue Toon joined us in League 1, considering how close to the wire the title race went. Credit to Stenny for coming up through the playoffs. Hope our failure to secure McGuigan in the January transfer window doesn't bite us on the bahookey tomorrow. Here's hoping Rusty and Lewis, along with our young loanees, and the regulars can do enough to secure maximum points. As my current location precludes my attendance, I will be keenly following the live updates on Montrose's Twitter feed: only just marginally better than watching the Grandstand Final Score teleprinter, while waiting for a takeaway at the Yauli, on a Saturday back in nineteen special fried rice. I'd leave the defence and midfield alone but I suspect SP will tinker with the front line as it's an away game and I reckon he will find room for 6'5'' Russel McLean. Going with three up front still though is an absolute must. It's mostly worked for us and otherwise we simply hand the initiative to the opposition. Been a few weeks since McMenamin has been able to make a decision about team selection. Debut to Hurst I presume. Marsh in for Neill at the back, but who knows what he will do with the midfield. Heard good things about the new lad from St Mirren, but expect he will start on the bench. At least McGuigan didn't score. Disappointing after Brechin result. Will need to ratchet up several gears for Forfar game. I think a draw would probably have been the fairest outcome but, as the old adage goes, if you don't take your chances, you don't score and today was a bit of ordeal for young Russell McLean. The striker passed up three very presentable chances in quick succession and should probably have won his side the match. 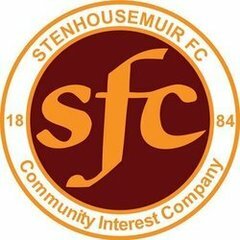 But he didn't, Graeme Smith kept him out, and Stenhousemuir moved off the bottom of the table courtesy of Greg Hurst's first goal for the club. And what a good goal it was! Alan Cook's searching pass was controlled by Mark "Mr Goals" McGuigan, who sent a smashing reverse ball into the debutant's stride and his finish was hard and low underneath Allan Fleming. Lovely stuff. The first half was just terrible. Stenhousemuir had a spell of pressure and Montrose had a spell of pressure but other than a long-range effort from Cook that sailed wide of the post, nothing happened. The second half was a bit better - Cook should have scored when McGuigan teed him up but he inexplicably decided to check back onto his left foot and his shot was well blocked, and McLean should have scored for Montrose - but it was all a bit samey. You can't play long-ball football against defenders like Sean Dillon, Andy Munro, David Marsh or Michael Bolochoweckyj because it's meat and drink for them. When we tried something different, it paid off. We could have added to our goal immediately after when McGuigan's header bounced off the top of the crossbar. Cook should have been sent off when he dived into Graham Webster - it looked like a terrible tackle from my vantage point - and I was surprised it only merited a caution. There was some clamour for Paddy Cregg to get sent off for booting Connor McBrearty late on but a yellow card was the right call. All in all, a very good day. We're off the bottom of the table for the first time in months, we've kept two clean sheets in our last two matches (Munro has been an excellent addition) and we now seem a bit more capable going forward. Hurst took his goal well and Cameron Breadner, making his debut, looked the part with a couple of adventurous runs down the wing and a decent effort from distance. He'll be an asset. We are now a really solid side, right across the backline. And Conor McBrearty seems to have found is calling alongside Mark Ferry as a holding midfielder. We are not going to score a lot of goals playing this way, but if we win 1-0 every week it won't matter. Absolutely - I thought Alan Reid had another good game at right-back. He's turned in some handy performances over the last few weeks. He doesn't offer a lot going forward but he's defended well, so fair play to him. What did I say above!! So we went with effectively a lone striker who hasn't had much if any game time this season. What do I know - I only watch games from the stands/terraces. A very fair summary of what happened today. Think we went into the game trying not to lose and ultimately paid the price. Hopefully, a lesson learned for us. Cook’s tackle was horrendous and a red all day long. Stenny look much more resilient than in previous meetings. If they can grind out some more results they might be able to escape the drop. As for us, maybe just do what we’re good at and stop overthinking the tactics. Win 5-2 and then completely change the front line? I thought right away that Cooky would be looking at a red once play stopped but bizarrely the ref wasn’t even looking for him for the booking until he realised the boy was still decked and took an earful off the Montrose players. The Cregg challenge was always going to be one of those that matched an earlier decision...if Cook had walked, he would have too, so I don’t think the Montrose contingent can be too upset. The two new additions off the bench look like very handy upgrades, and what a difference Big Andy Munro has made, an absolute marshall-in-chief at the back and agree with the good point made above that even shaky players like Reid are looking much more comfortable playing in that backline with a guy like him helming it. Lots to be positive about. And finally we get three points without Dumbarton and Brechin pacing us! I’ll take it, whatever the circumstances.